Over 7 years in the making, it’s finally here! ‘Live Your Life – the story of TeapotOne’ DVD is an indepth look at what made me embark on this epic, life changing adventure, and how it has effected me – warts and all. The DVD has been professionally edited and produced by Geek Media and they have done a spectacular job. Check out their promo for the DVD here. Check out the full description below. With the entire trip being documented and available for free on the youtube channel at youtube.com/TeapotOneVids, I didn’t want to just take the footage, make it into a DVD, then charge you money for the same thing. 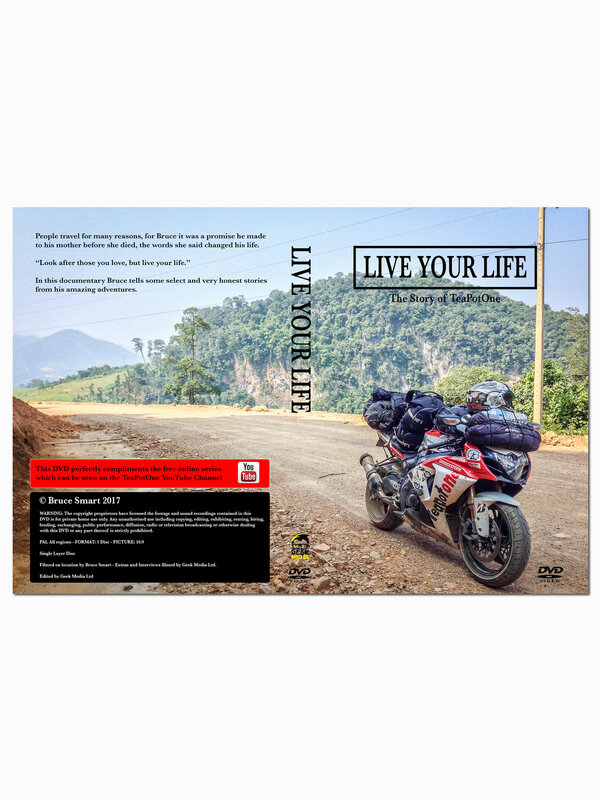 So this DVD is something special, a much more personal account of the trip, going into detail about several aspects of the adventure which people often ask about, as well as some very personal information that I’ve never spoken about to anyone. Really experience this amazing trip in a way few others let you share. This is a great look in to Bruce, his inspiration for the trip, the highs and the lows, and compliments the free youtube videos of his trip. It isn’t just a copy of the youtube videos, in fact there isn’t that much footage of the trip itself, mainly a careful selection of clips showing certain events. However, the DVD goes in to more depth on these events, and you get a pure sense of the emotion that Bruce felt throughout his epic trip, from the initial thoughts and planning, through to adjusting to real life on his return. I found myself with a lump in my throat at some points, and smiling like an idiot at others, but one thing is for certain, Bruce definitely does his Mum proud. Buy the DVD, you won’t be disappointed, and in Bruce’s own words: Live your life! Crikey Jon, thank you very much for such a great review, I’m chuffed to bits that you enjoyed the film so much. Come and check out the NEW range of TeapotOne Clothing available in the 'Spreadshirt' shop. 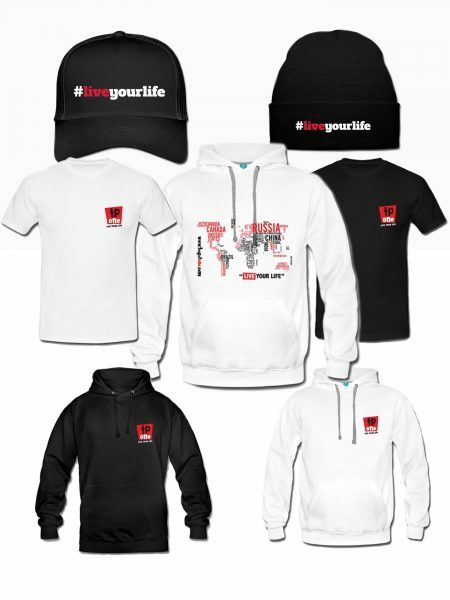 We've got T-Shirts, Hoodies, Beanies, Baseball Cpas, with more items being added all the time. The entire procurement is handled by 'Spreadshirt' so you're sure of a top-quality product every time. Please visit: https://shop.spreadshirt.co.uk/teapotone to check out the range. All weather vinyl logo decal, featuring the 'LIVE YOUR LIFE' tagline. Dimensions: 47mm x 43mm (max) Please post up a pic of your sticker/s wherever you put them - (within reason!) to the TeapotOne Facebook/Instagram/Twitter pages. Over 7 years in the making, it's finally here! 'Live Your Life - the story of TeapotOne' DVD is an indepth look at what made me embark on this epic, life changing adventure, and how it has effected me - warts and all. The DVD has been professionally edited and produced by Geek Media and they have done a spectacular job. Check out their promo for the DVD here. Check out the full description below.